In a conference full of coaches with championship rings (Urban Meyer, Steve Spurrier, Nick Saban, Les Miles, etc), and another who no one can stop talking about, a former high school coach continues to receive his fair share of scrutiny. And he's not even the head coach: enter Gus Malzahn, new Auburn offensive coordinator. Malzahn has been asked to deliver on the promise that Tommy Tuberville and Tony Franklin failed to; namely, a "spread" offense that actually produces. There are a few differences here between Malzahn's offense and what Franklin and Tuberville tried to do (or said they were trying to do). The biggest, I'd say, is that Malzahn's spread is not exactly like other spreads, whether pass-first ones like the Airraid or run-heavy spreads like Urban Meyer's or Rich Rodriguez's. That's because the schemes are simple - very, very simple - and the core of the offense is not even about schemes: it's about tempo. . . .
[N]obody does what Malzahn does. If some no-huddle teams, like Franklin's, are light-speed, then Malzahn wants to spend the entire game in something akin to "ludicrous speed." This past spring, Malzahn installed his offense with signs of progress, though he has yet to get everyone up to his preferred "ludicrous speed" yet. That will come. With talk about his overarching philosophy out of the way, however, it's still worth asking what his Xs and Os will actually look like. And, if spring practice is any indication, we know the answer: a lot like they did at Tulsa. At Tulsa, Malzahn, with co-offensive coordinator Herb Hand (who deserves as much credit as Malzahn), blew the doors off just about everyone they played. In 2007, they were: sixth in scoring (41.1 per game), first in yards (543.9 per game), and third in yards per play (6.8). In 2008, after losing their quarterback Paul Smith -- who had thrown for 47 touchdowns the year before -- the offense actually improved: second in scoring (47.2 points per game), first in yards (569.9 per game), and yards per play (7.3). Much of that improvement came from the running game, which jumped from 172.93 yards per game in 2007 to 268.00 in 2008. Q: What makes your spread offense potent as compared to say, a Texas Tech or Missouri or a team like that? Gus Malzahn: We're a run, play-action team. A lot of spread teams are pass first, run second. But we're a run, play-action team. As a matter of fact, I think we ran the ball one more time than we threw it last year, which a lot of people don't know. We like to be 50-50 and be able to do both well. All that said, you can still consider me slightly skeptical of his claim to being a smashmouth guy. Back in his high school days, and even during his time at Arkansas, those around Gus always said if he had his way he would have thrown it about as much as was humanly possible. We're talking Mike Leach, June Jones stuff. But, people change, and his experience with Coaches Graham and Hand at Tulsa (much moreso than his experience with Nutt at Arkansas) appears to have heavily influenced him. Hand, a Rich Rodriguez disciple, not only helped implement many of Malzahn's ideas, he also brought many of his own to the table, particularly regarding the spread run game. But the proof is in the pudding. I am familiar with what Tulsa did, and I finally have been able to see what Auburn implemented during spring practice. And it is much as I expected: it is a smash-mouth spread operation. Indeed, the spring offense was notable for quarterback inconsistency, yes, but also for big, big plays from the running game. As a preview for this upcoming season I will describe three plays Malzahn can be expected to use at Auburn, none of them particularly revolutionary: the counter, the zone-read with bubble screens as a read, and the power. Each has old roots, though Malzahn will do his best to aid their effectiveness through lots of motions, fakes, and shifts. Expect the tight-ends or H-backs to play a big role in the offense in making key blocks, and also expect to see lots of wide receiver motion, with their either getting the ball on reverses or as pitch men on the option, or merely faking so. So what does it look like when Malzahn uses it? Well it's basically the same, except he might show a few different things before the snap. Specifically, he might use an H-back or fullback type player who comes from the backside to be the "puller" who leads into the hole, and that player might begin the play split out wide and motion in across the formation. Or, the runningback himself might motion into the backfield. There's lots of options. 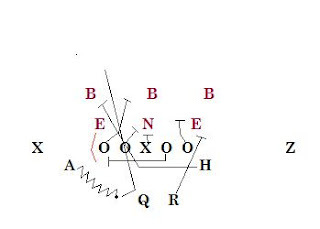 Below, however, is a diagram of what Malzahn did in the spring game; the play went for a long touchdown twice in the spring game (thanks to good blocking and some weak angles by the defense). To take one of the examples before getting to the film clips, the offense lined up in a basic shotgun set, with one runningback, one H-back, and three receivers. I have only drawn paths for two players: the backside guard pulls and kicks out the defensive end, while the H-back pulls and leads into the hole (and eventually also kicks out the linebacker, though he could have just as easily "hooked" him inside, had the linebacker stepped that way). The rest of the line just blocks down, and the runningback takes his slight counter steps and explodes into the hole, following the H-back's block. To see it all in action, check out the film clips from the spring game this past year. If all this looks familiar, even from a spread set, it should. Compare what Malzahn is doing above with what Urban Meyer does at Florida. First a diagram, then basically the exact same play run with Percy Harvin. There are differences, but most of them are cosmetic. Same play. Auburn is just hoping it works as well for them as it has for Florida. I won't get too far into the basics of the zone read; I have both discussed it previously and also plan to go more in depth in the future as teams defend it differently nowadays. What you can expect from Malzahn and Auburn is much in the mainstream in terms of the play. The line will zone block, and the runningback will look for a vertical crease. The quarterback will read the backside end to determine where or not to give the ball to the back or keep it himself. The one wrinkle Malzahn brings -- which again, is something Rich Rodriguez has been doing for some time -- is to build the bubble screen on the backside in. Basically, if the backside pursuit cheats in too much, Auburn has its constraint play built in: the quarterback can always pull the ball and throw the bubble. Below is a diagram and a video of Auburn running the zone with the bubble on the backside, though the quarterback just gives it to the runner. The "power" run is another that has ancient, "power football" roots but has been adapted to the spread. And it, again, is very simple: the line essentially "down" blocks, meaning they block the men over them or to their inside, and will use teamwork to combination block the defensive linemen until one releases to hit the linebackers. The exception is the defensive end or other outside, on the line of scrimmage defender. (Aptly referred to as the EMLOS -- "end man on the line of scrimmage.") The fullback -- or H-back, or someone -- plows at him to kick him out, thus opening a crease. And below is a common look Malzahn ran "power" from while at Tulsa, using the "pistol" (short shotgun with the runningback directly behind the quarterback) and a cross between an H-back and a fullback. See below. So this is about what you can expect: some basic plays -- including power plays -- from spread sets with lots of shifts and motion, all at a top speed. Malzahn will try to go for some play-action and big plays off of this; I may diagram some of those later. How well it all works will depend on execution, particularly by the quarterbacks. Time will tell. But a final thought. Another thing to expect from Auburn's offense this year will be lots of motion from the wide receivers and their use as a threat to run as well as catch. Now, all of these "versatility" roles -- H-backs and receivers as running threats -- depends on depth and skill at those positions (easier if you have Percy Harvin), but Malzahn likes to to give the look so as to at least present the problem to the defense. From the "power" look above, Malzahn likes to motion an outside wide receiver completely behind the runningback, and he then gets into a pitch relationship with the quarterback for an option. This way Malzahn can fake the power play and run the speed option with the quarterback (Kodi Burns?) with the receiver as a pitch man. It's fun stuff, at least when it works. Once he has done that, the very fact of the receiver in motion tends to help draw defenders when they do simply hand it off to the runningback on the power play. Will it work in the SEC? I don't know, but if it does, expect plays like the one in the video below to be on all the highlight reels. Notice how the motion by one receiver sets up the sweep in the opposite direction by the other. With Malzahn's offense, don't just try to watch the ball, because that will rarely ever tell you where it actually is. How fast was Auburn's pace? Any idea based on the spring game? I'm sure they were "fast" but was the pace causing any real problems for the defense? The A-Day game would not be of any use in determining the effectiveness of the offense versus the defense because the A offense played the B defense. Also, they switched QBs every now and then, alternating between Kodi Burns and Neil Caudle. Burns moved the team well, but did not display good passing technique. Caudle was a more effective passer, but was not a real threat with his legs. I am not sure if this has already been covered on this site elsewhere, but how do you get those cut ups (directly from YouTube already? )and how do you get them to imbed? DoubleB, KungFu: My understanding is that the pace was faster than before but not yet to what it was at Tulsa. That's to be expected. They have to learn the basics first. It will be interesting how they are in the fall. And re: success versus the defense, that's true, I'm not saying they will average 500 yards a game in the SEC. The spring game is a legitimate place to look for *what* they are doing, especially the bread and butter basics. How *well* it all works is a different question of course. But for now, before the season, the what is the more interesting (and measurable) question. anon: I get the clips from a variety of sources -- files, DVD, etc -- but from there it is pretty simple. I use Windows Moviemaker to edit them (not all that high tech), and then YouTube lets you upload stuff for free. YouTube also provides the code for "embedding" video. All you have to do is have a place to paste it into -- i.e. a blog. Malzahn's ideaology is intriguing; not too many offenses are based on tempo and pure speed of execution. It's going to be interesting watching how it works out for him at Auburn; I'll be shocked if his offense becomes as productive as it was in Tulsa within the next two seasons. It'll take a few years of recruiting and installing for it to even get close, if it even does reach that level. As for the speed of the offense, there were scrimmages in the spring, including one point in the A Day game the coaches had to tell the offense to stop and let the defense catch up. Kodi Burns(jokingly) complained that wasn't fair to the offense. Like Chris said though, the clips are just basics of what we can expect next year. It all depends on execution against SEC defenses, which we all know is about as tough as it gets in college football. Malzahn will never have the Urban Meyer type success offense that he had in 2008. It may work at Tulsa, but not at Auburn. For starters, his offense talent level is very low. It would take him years to build up the talent level to successfully run that offense. By the time that day comes, he'll be long gone from Auburn. Tony Franklin had success at every stop he made, except Auburn of course. Why? Because he didn't have the proper talent to run his scheme. The same will happen to Malzahn, barring a miracle of course. I wish him well because I know he's an offensive genius; however the lackluster offensive talent level is a major concern at this point and time. "For starters, his offense talent level is very low. It would take him years to build up the talent level to successfully run that offense. By the time that day comes, he'll be long gone from Auburn." Auburn's talent level is much higher than you're crediting them for. Their offensive line will be excellent next year, and they've got very talented running backs. The receivers have talent but have suffered from years of poor coaching. Kodi Burns' issues aren't from a lack of talent. As for the talent issue, it's there. It's probably not as deep as Fla right now, but the starters are actually pretty good. The RB's have great speed, and the WR have lots of potential, but like has been said, I think the coaching in the last staff was not quite up to par for them. I think Trooper Taylor will really turn that position around. I won't get into detail, because I would go on and on, but the only depth issue Auburn has on offense is depth at OL. The starters are pretty good, but they've only got like 10 OL on scholarship at this point, which can hurt if injuries occur. I see on of the incoming WR's, DeAngelo Benton, getting immediate playing time and making a substantial impact. QB is definitely an issue. This will be Burns 3rd OC in as many years, so obviously he's had quite a bit of flux in his time there. Caudle looks really good throwing the ball, as long as he's not forcing it. He's never really been given a chance yet and I think this new staff is right to make the race wide open. FWIW, Caudle was a 4 star, Elite 11 QB out of high school. His speed is probably comprable to Burns, but Burns is very shifty. Burns is really not that fast(probably in the 4.7/4.8 40 range), but he's very quick and really bounces around well in traffic. Incoming freshman QB, Tyrik Rollison, will be given a chance as well. I doubt he'll win the starting job, but the coaches have said the incoming QB's are fair game as well. I do see Rollison becoming the future of Malzahn's offense though. The kid put up huge numbers in Texas his jr and sr year. Incidentally these plays are also staples in Clemson's offense. Dr. B., is that a litle cold water to dampen the enthusiasm? Zach - I wouldn't call the AU OL excellent. They are one injury away from having to move a TE or DL over. Plus, while they were ok last year, they didn't set the world on fire. The type of blocking they have to do in this system is different from what most of the OL was signed for. I still don't understand why everyone is so high on Burns talent. He's not produced at all, and while he might run fast and throw a ball 80 yards or whatever, a majority of a QB's talent is in making the right decisions with the ball, which he hasn't done yet. might be coachable - Jason Campbell certainly was (he made horrible decisions until his snr year when he got a new QB coach). I don't know if Malzahn does this but another wrinkle for the counter from the Gun 4-wides is to run it like a zone read play. Have the QB read the backside DE and if he's slow or doesn't commit give ball to RB, otherwise you're constraint play is built in; have him pull the ball and run. One thing that's interesting from the clips is that the play broke up the middle a lot. I find that often the counter starts as an outside run, then as LB's over pursue you start to get more of a middle cut back crease. A great example of the power play working a treat is Willie Parker's 75 yrd TD run in SB XL. But as you say just about everyone has this, or some variant, in the playbook. It's easy to see why this offense is a better fit for Auburn than franklin's was. Anon - dont forget multi-talented Mario Fannin. I am looking for him to be a huge fantasy breakout star. Last year's offense was way too predictable plus if we ever did get a lead Tuberville sat on it and ran the shotgun sweep the rest of the game. We had nothing like the misdirection you will see in Malz running attack. He uses your pursuit against you. We have a very good power back in Tate and what I think is the perfect run/catch threat in Fannin. Those two should go off in this running game and open the play-action passing game. I'd just like to point out on the two video examples of the counter the defenses made some critical errors that opened up big plays. In the case of Auburn, the play side DE correctly followed the OT as he crashed down into the DT, which should push the play inside if not for the pulling guard. However, the play side LB took himself out of the play by moving vertically up field to the DE's ouside and not identifying the pulling guard. In the case of Florida, the DE simply ran to the outside and didn't seal. This opened an opportunity for the play to have a wide open lane. I agree that it's a good play, these examples just aren't all they seem. It is my opinion that THIS is the offense Tubs wanted and thought he could force Franklin to manufacture. The entire blog basically says Malzahn is running tried and true power, counter, trap, zone, and play action, and just packaging it in "the spread" (a la Meyer)...so, assuming Auburn has the players, why wouldn't it work in the SEC? The piece is not presented as a predictor of any given level of success...it's written to illustrate what Malzahn does. The spread can work anywhere the weather is great. In bad weather venues the spread may see teams call the pass game out. Go plus one, always for the O into the parts of the field that are sloggy, game them on the outside in coverage. The only issue with that is there's still a plus one chance for the running QB. Even when you bring numbers he can still run. They can leave both ends unblocked and fuzzy every read the second level has. What kind of success will the spread have in the weather conferences? It may depend upon play surface, the CFL did wonders with it for year with an extra defender out there, mostly on fast surfaces. Will the weather games limit Rich Rod's plan from its upside? The most famous "smash" of all? Urban Meyer to quit spreadin'?